289 pages | 1 B/W Illus. Whereas our nation was once united in purpose, today it is bitterly divided. Why? Racial discrimination, diminishing educational opportunities, poor economic mobility, greedy corporations, and an unresponsive federal government have combined to create two Americas. 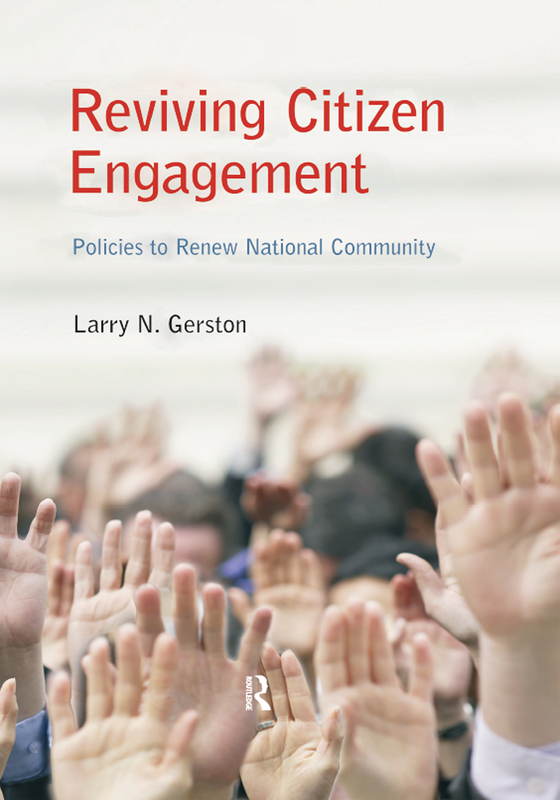 Presented in Gerston’s characteristic, no-holds-barred style of wit and candor, Reviving Citizen Engagement: Policies to Renew National Community casts a harsh light on the current state of American public policy. It then offers approaches to healing some of the country’s most pressing problems. The book begins with an assessment of the extent to which America has become a fractured society and the residual damage from the social implosion. It then examines the fragile condition of the 21st century electorate and a political system where private power too often has overcome values intended to protect the public good. The author argues it isn’t American entitlement run amok, but suggests there really is a powerful disconnect. The large number of Americans who have been left out of the system are no longer engaged citizens. This development represents a monumental threat to American democracy, for our democracy can succeed only if its people believe they have the opportunity to succeed. This book not only provides evidence of our frayed society but also includes recommendations for strengthening America’s social fabric. It details the steps we can—and must—take to repair, rebuild, and renew American society. Gerston contends they are within our reach if we are willing to make the sacrifices long overdue in what historically has been recognized as the world’s most powerful and successful nation. "This broad-ranging critique of the American political and economic system attempts to help readers understand contemporary citizen disengagement. Replete with extensive public opinion and empirical data, this book by Gerston (emer., San Jose State Univ.) chronicles significant shortcomings of the political system such as income inequalities, voter suppression, and disregard for international law. … the book ends with a wide-ranging set of corrective actions that might be taken. …. Summing Up: Recommended. Upper-division undergraduate, graduate, research, and professional collections." The Growing Chasm Between the "Haves" and "Have Nots"
Safety Net programs in the 21st Century: On the Money or Out of Touch? Larry Gerston is Professor Emeritus of political science at San Jose State University. A specialist in public policy, he has written eleven other books in addition to Reviving Citizen Engagement: Policies to Renew National Community. His policy books include Making Public Policy: From Conflict to Resolution (1983), Public Policy Making: Process and Principles (1997), Public Policy Making in a Democratic Society: A Guide to Civic Engagement (2002), and Confronting Reality: Ten Issues Threatening to Implode American Society (2009). Gerston’s Not So Golden After All: The Rise and Fall of California was published by Taylor & Francis in 2012. Along with his larger works, Gerston has written numerous journal articles and penned more than 125 op-ed pieces in leading newspapers. He appears weekly as the political analyst at NBC Bay Area (the NBC-owned television station in the San Francisco Bay Area), and has also been interviewed for his political insight on NBC Nightly News, CBS Evening News, BBC, NPR, and CNN’s Inside Politics.